Keep your eyes peeled if you've never been to Brechin before and are looking for the ground ? it is down a narrow laneway, which opens out to the car park. Just following the red and white scarves and hats may be the best option! The main stand is in front of you as you walk in, and the toilets, teabar and entrance to the seats are all found under this stand. If you want to stand on the terracing, head round to the left of the main stand. This is the Hedge Side, which is four concrete terracing steps and no cover, and runs the entire length of the pitch. This leads to the covered terrace behind the goal (Cemetery End), and the Club Shop is situated at the far corner of this terrace. 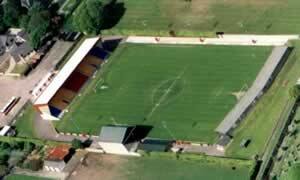 On the opposite side of the pitch is the ramshackle old stand, which sits squat on the halfway line and seats 300. It costs ?1 extra to sit in here, and the players and sponsors lounge, press box, first aid post and dugouts are all on this side. The pitch is lower than the surrounds and you get a great view from everywhere in the park, although the Cemetery End Terrace does have some pillars, and you may well be looking into the sun if watching from the hedge side. Take the A90 and come off at the first 'Brechin' turn off (B966.) Travel through Trinity village and on entering Brechin, you'll find the ground is on the left-hand side of the road. Take the M90 to the A90 and continue past the first 'Brechin' turn off. Come off at the second turn off on to the B966. Travel through Trinity village and on entering Brechin, you'll find the ground is on the left-hand side of the road. The nearest railway station is Montrose, which is 8 miles away. There is a regular Inter-City train service to Montrose from all parts of the country and fans alighting at Montrose can then catch a connecting bus service to Brechin. Brechin bus station is only a few hundred yards from the ground and buses on the Aberdeen ? Dundee (Citylink) and Montrose ? Edzell (Tayside Buses) routes stop here. If you are a registered user then you can login, and create your own personal review of Brechin City - Glebe Park. These reviews can be private or public.